Audi, the German Luxury carmaker after revealing various spy images, has now completely revealed the new car via a Video giving complete information about the added features. There are not much changes to talk about while side view is concerned, just a new set of alloy wheels and that's it. As far as rear is concerned, an addition of chrome strip around boot lid is there along with changes in tail lights. 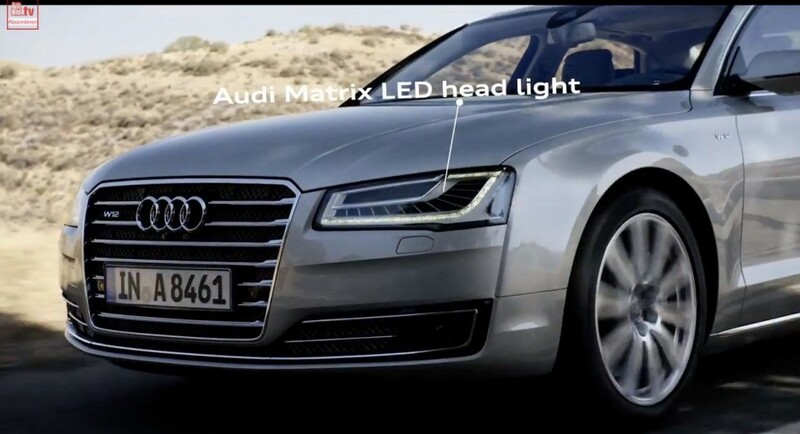 On the front, a welcome addition of LED Matrix headlights is there.The new technology automatically dims while there is a close coming traffic from the opposite side to avoid any disturbance to the person / vehicle coming. The A8 in this video happens to be the long wheelbase version with the W12 engine. Whether the Matrix technology is offered as standard or as an optional extra is something we’ll know once the official announcement has been made. Watch out the entire Video now and view the additional featured the German car maker has to offer on this one.